A 2 pc set with color choice vest. 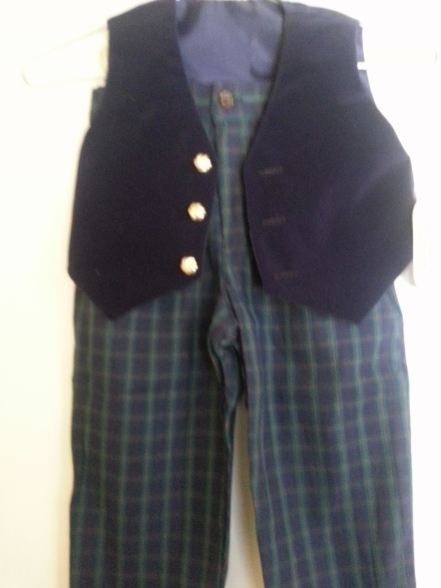 Durable nice quality 100% cotton blackwatch plaid pants in navy and hunter green with a bit of red running through. Toddler sizes. Elastic back, pleats and belt loops. Straight leg. They run true to size. Great dressy-casual equestrian style pants. Paired with a US made cotton velveteen vest. The vest is a fully lined cotton velveteen with gold buttons. Both pieces are Machine washable though we recommend hand wash for the vest or delicate wash.
See also the magnetic belts and newsboys caps to go with your look.